Sold EUR 34,53 Buy It Now or Best Offer, EUR 23,33 Shipping, 14-Day Returns, Pay with PayPal and you're fully protected. Seller: timerunner56 (891) 100%, Location: Bournemouth, Dorset, Ships to: GB & many other countries, Item: 292130385204 German Kaller 400 Day, Torsion, Anniversary ClockA very nice German Kaller 400 Day, Torsion, Anniversary Clock. 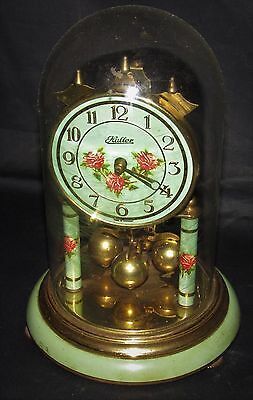 This very pretty little clock has a clean movement but does need a suspension cable and hand so isn't running, consequently it is sold as seen for restoration. The glass dome is present and in good condition (one minor edge nibble). Nice floral decoration to dial and pillars are also good. Measures around 8.5in tall. There is some rubbing paintwork/metalwork conducive with age and use. A nice restoration piece. Happy to answer any questions, either via message or phone ( 07761 432112 ) Terms and ConditionsAll my items are sold for restoration and consequently sold as seen without a guarantee. I do not sell reproduction items or copies, I also do not clean or restore my items but prefer to offer them in a genuinely sleepy state ready for professional restoration. I often do have items for sale that are in superb 'ready to use' condition and have many satisfied clients built up over 20 years. Please see my feedback.UK buyers, please make payment by Personal Cheque or Paypal. I do also on occassion accept payment in cash when the items are collected in person. Overseas buyers must pay by Paypal only in UK Pound Sterling. Please note that the buyer is responsible for any costs relating to customs including Import tax.Please ensure you have the funds to pay for your item prior to leaving a bid.Please always obtain a shipping cost prior to making a bid. I always pack my items very well and securely using appropriate materials. ALL my items are sent by 'Recorded Delivery' and require a signature upon delivery. Please note that as all shippers refuse to insure antique clocks in transit I cannot offer a guarentee for their safe arrival, but will always ensure that they are well protected in transit and with a recognised courier. The item will be tracked within the UK and a proof of postage will always be provided. I am also happy to always combine postage for multiple purchases.In the unlikely event of a problem, please contact me first so that I can have the opportunity to arrange a solution. I always appreciate positive feedback, which I am happy to return after I have received it. Please ensure you have the funds to pay for your item prior to leaving a bid. Popularity - 2.445 views, 3.5 views per day, 697 days on eBay. Super high amount of views. 1 sold, 0 available. 2.445 views, 3.5 views per day, 697 days on eBay. Super high amount of views. 1 sold, 0 available.